There seem to be endless articles prescribing the reasons the top goal has failed over the years. The technology is ahead of the business. The business didn’t know what questions to ask. The service provided was seen as being technical in nature. The list of hackneyed one liners goes on. The answer is simply the fact that it’s the CIO’s priority, probably mandated to him/her by one of the other C’s who doesn’t want it to really be their responsibility. 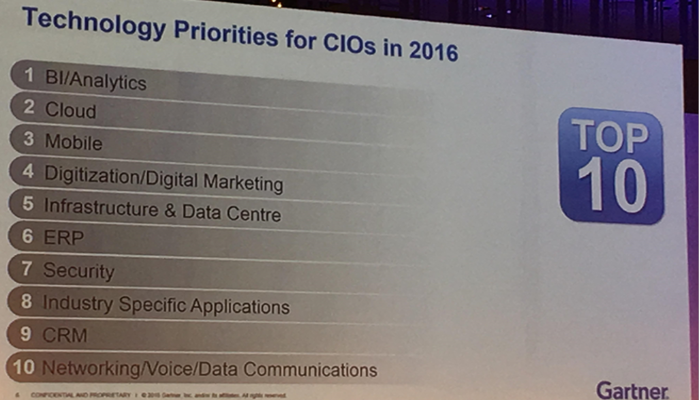 Unless you’re a tech company, the CIO probably occupies a place a little lower on the totem pole. IS/IT is seen as a cost center, and not a revenue generator. The CIO will probably try and offer some BI/Analytics value up the food chain, but the whole team will be swimming against the current to deliver anything more than the business already knows. That’s not going to get anyone excited. A friend of mine recently pointed out that this is basically Conway‘s law. “Organizations which design systems … are constrained to produce designs which are copies of the communication structures of these organizations”. The same thing is applicable in Analytics/BI. In other words, the nature of communication and the org structure in the business will define the questions the business will ask. Therefore, it’s appropriate to think, if the right question isn’t being asked, are they setting the table to ask the right question? So what does the org chart look like? Report/ETL developers squarely in IT, with BA’s occasionally working for the business, but mostly provided as a corporate service through IT to bridge the gap? Where does most of the political capital accumulate for the BA, in the business or in IT? That ought to warm you up to where I’m going with this. Let’s first distinguish between analytics and business intelligence. This should be straight forward, but it gets somewhat confused in the value proposition made to business. Analytics is the process of discovery through data. Business Intelligence is the process of taking that discovery, formalizing it, and sustaining it. Analytics roles should reside in the business. How effectively that function can perform in the business is a matter of foresight of the leadership. That role is best leveraged at an senior leadership level, where the individual needs to deliver small iterative value frequently in order to build trust. When some level of trust is built, that individual can then begin guiding the business into asking the right question. A proficiency in emotional intelligence, as in being able to read your organizations behaviour is key. That individual also has to understand most of the business drivers, EBITDA, OPEX, capital allocation, etc. Reading body language, active listening, a strong sense of tact, and a small ego are key. Finding someone with that blend of social proficiencies and a technical aptitude is challenging. You want a personable nerd, and they are tough to find. Once that level of trust is built with senior leadership, that allows the individual to influence the culture of the organization through leadership and information. Information is the platform upon which cultural change is made, and leadership has to facilitate it. After all, the information and the leader help manufacture consent, and drive everyone towards a common goal. Continuous improvement in a nutshell. Business Intelligence is a practise that has to technically sustain and deliver what leadership and analytics have done. In order to create a culture of continuous improvement, the information and reinforcement from leadership have to be consistent. I don’t intend to diminish IT/IS services, as they do play an important role in the sustainment piece. These services are truly programmatic, and the analytics should have delivered the instructions. In the fast iterations the analytics role will have taken, there will have been some technical debt created. It’s the role of the BI team to remove that technical debt (moving everything needed into the DW), and creating a sustainable infrastructure around it. It would be easy to clearly define these roles, but alas, personality supersedes role. You may find an analyst who has the all of the skills, but lacks the personality or character. If you’re looking for someone to fill this role, you’re better off hiring an analyst on character rather than skill. The latter can be learned and the former is either there or it isn’t. Floats the idea, creates the momentum, takes the initiative. Accepts failure as a part of the job.